Do You Have Unwanted Scarring on Your Face? Do You Have Acne Scars? Imagine yourself with beautiful skin that’s free of scars. It’s not a dream; it’s a reality thanks to laser scar treatment that simplifies scar removal for many types of scars from surgery or acne scars. Scars result as a cut or injury to an area of skin and can have a tremendous emotional impact to our wellbeing. Unfortunately, there are no scientifically proven product or technique to eliminate scars completely. However, there are new technologies that can dramatically improve the appearance of scars and minimize their visibility. At Noydeen Beauty, we embrace the use of advanced laser technology to minimize facial scars that are noticeable. Laser scar removal is a nonsurgical treatment option that’s ideal for clients seeking to minimize the appearance of surgical scars or acne scars on the face and body. 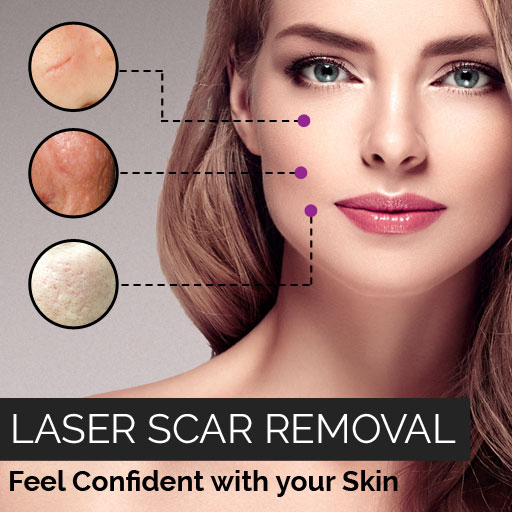 Unlike surgical scar treatment that requires incisions, laser scar reduction uses fractional laser light to break down scar tissue and trigger healthy new tissue production. The scar will become more even in color and texture and it will blend more naturally into the surrounding skin. The scar reduction treatment at Noydeen Beauty is a noninvasive procedure and can take as little as 20 minutes per treatment to perform. With proper treatment cycles and wound care post treatments, our clients can expect dramatic improvement in the appearance of scars, to a point where they are barely visible. Clients who undergo the procedure typically resume their normal activities immediately following the session, making this a simple procedure that fits today’s busy lifestyles. For more information laser scar removal to schedule a consultation, contact Noydeen Beauty! Everyone’s skin is different and at Noydeen Beauty, we encourage a medical consultation to make sure your going to get the great results from laser skin resurfacing. Let us customize your treatment plan and get your confidence back. Laser scar reduction is designed to treat surgical and acne scars on any area of the body and face. What types of scars marks can be treated? Scars that are less than 6mm Noydeen Laser is designed to treat stretch marks caused by pregnancy, weight gain and body changes due to puberty. Laser scar removal can be safely used on most skin types. During your consultation, Noydeen Beauty will determine if you are a good candidate for the procedure based on a variety of factors. This is dependent on the size of the area and the condition being treated, however most sessions take no longer than 15 to 30 minutes. Depending on the condition being treated 3 -6 treatment sessions are recommended for scar reduction.